Automatically blocks IP addresses with hacking attempts on your windows server services (rdp, FTP, SQL-Server) using the Windows firewall. The software runs as a Windows background service and monitors RDP, FTP und SQL-Server events for failed logins. 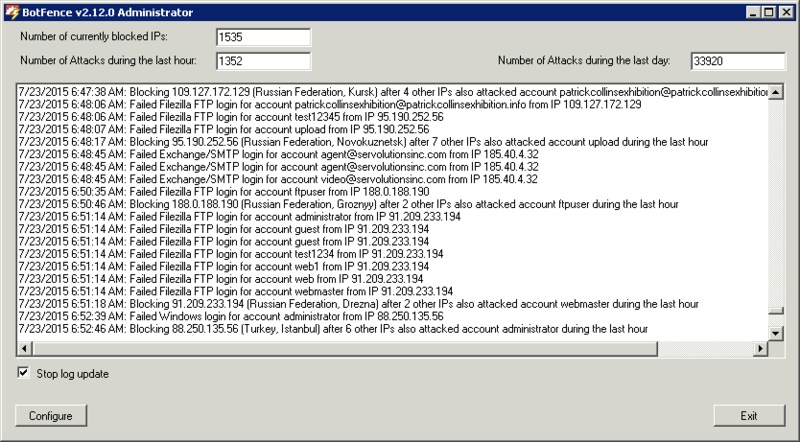 If a configurable number of failed login events is detected from the same IP address BotFence dynamically lists that IP address im the Windows firewall as blocked. USB Log & Lock allows you to control operations with USB devices on computers connected to the local area network of an organization or enterprise. With USB Log & Lock, you can forbid USB devices with the help of flexibly customizable rules. File Lock is a secure software that can lock and/or hide your files, folders and drives. It can prevent access to any of your files, folders or drives. File Lock also supports to hide files and folders, to make them complete invisible. This robust application safely denies access to your private data and grants access only if you enter the correct password. You can make your data hidden, locked, or read-only. Download this utility now! Want to access your PC anytime, anywhere, but don't like throwing money away to an always-on system? Now, PC in My Hand will help you realize your ideas: boot and control your system by iPhone, ipad, Android, BlackBerry, PPC, Palm etc..